We would like to welcome you to our on-line sales websites. We are a major distributor of all of the manufactures of avionics (both Certified and Experimental), pilot supplies and accessories. We can distribute our products throughout the U.S, Canada and many foreign countries as well. We are currently providing two methods of online shopping. If you have any questions regarding our online sales, please contact sales@aerotronics.com for further assistance. 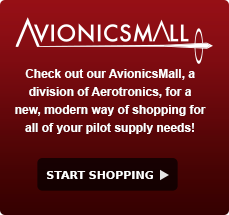 Our eBay store has been designed around our used and consigned Avionics. Our Avionics Mall has been designed to provide our customers with a variety of the most popular and commonly asked for products and accessories.